WINDHAVEN gets a Graphic Novel make over! The classic fantasy novel co authored by GRRM and the talented Lisa Tuttle is being rereleased from Penguin Random House today in Graphic Novel form! 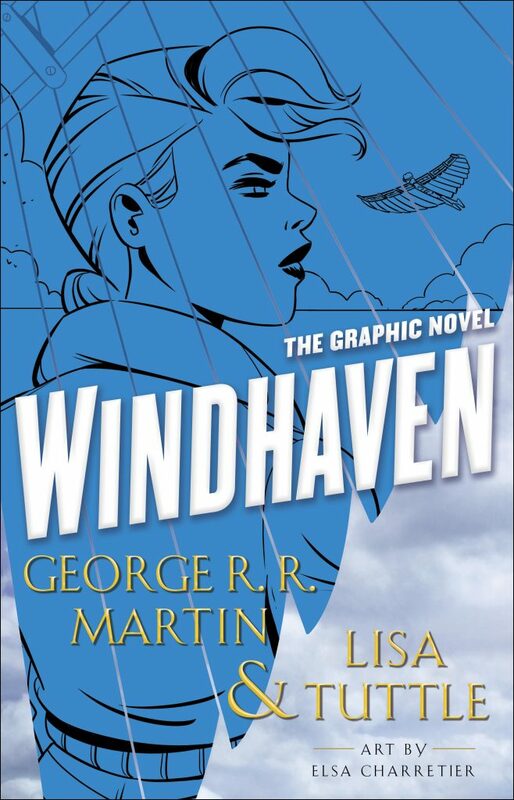 Illustrated by Marvel Comics artist Elsa Charretier who has re-imagined the high flying political intrigue and sweeping sky scapes that will carry you away to the world of Windhaven. Get your beautifully illustrated hardcover edition of the Windhaven graphic novel today! Among the scattered islands of the ocean-bound world called Windhaven, no one holds more prestige than the silver-winged flyers—humans borne on handcrafted wings who cross treacherous seas, braving shifting winds and sudden storms, to bring news, gossip, songs, and stories to Windhaven’s far-flung communities. Maris of Lesser Amberly is only a fisherman’s daughter, but as much a descendant of the star sailors who founded her world as the flyer family who adopted her. She yearns to soar high above the water on the sky’s buffeting currents. But it is Maris’s stepbrother who stands to inherit the irreplaceable wings when he comes of age—though he dreams of pursuing a very different path. So Maris dares to challenge tradition and the law by demanding that flyers be chosen by merit rather than inheritance. Determined to establish flying competitions and training academies for those not of the flyer-born classes, she wages a bitter battle for change. But even as she triumphs, a host of new troubles confronts her. For a brewing revolution now threatens to destroy the world she fought so hard to join, and crush her proud, rebellious spirit—unless she is willing to make the ultimate sacrifice.